Michael Bostwick will start at centre-back for Posh against AFC Wimbledon. Photo: Joe Dent/theposh.com. Peterborough United boss Grant McCann has warned his centre-backs to expect a tough, physical battle against AFC Wimbledon in the first round of the English Football League Cup at the ABAX Stadium tonight (August 9, 7.45pm kick off). It promises to be a contrast of playing styles tonight as the Posh passing game will compete against the Dons’ direct approach. Former Posh striker Tyrone Barnett, a summer signing by the newly-promoted League One club, could be a key man for the visitors. Tyrone Barnett in his Posh playing days. Posh are without their biggest central defender as Ryan Tafazolli is out with a hamstring strain. Michael Bostwick, an effective substitute in Saturday’s (August 6) League One win at Rochdale, steps in. McCann will field his strongest-possible side as he wants a cup run to accompany a League One promotion push. 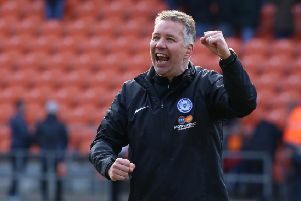 Hayden White is expected to keep the right-back slot ahead of fit-again Northern Ireland international Michael Smith as Posh attempt to end their Tuesday night curse. In 12 competitive matches on a Tuesday last season, Posh won 2 and lost 10. “There is no temptation to rest anyone,” McCann insisted. “I will play my strongest team. We structured pre-season so we played Saturday, Tuesday, Saturday to get ready for what we now face. “Everyone who is fit is raring to go. I used to love playing in night games under lights at the ABAX Stadium and I want my players to feel that. The atmosphere is usually good as our fans always get behind us. “Our record in Tuesday night matches last season doesn’t concern me, but our poor home form last season does. It’s something we have to put right if we are serious about being successful this season. We need to play well to keep the fans on board. It’s important we are united on and off the pitch this season. “I’m looking forward to watching us play at home. We looked a bit rusty in possession on Saturday, but we should get more of the ball tonight and I want to see it used well. “This is a tough game for us though. Wimbledon play in a certain way and it works well for them. They put crosses into the penalty area from all angles and they have a regular goalscorer in Lyle Taylor who usually plays alongside a big centre-forward. “It’s going to be a physical battle for our centre-backs and we must also be aware of knockdowns into our area. “Wimbledon lost 3-1 at Walsall at the weekend, but they had plenty of chances to score. The LOndon End terrace and the Motorpoint Stand are closed for tonight’s game to save costs.